Preheat oven to 375°F. Whisk mustard, oil, and rosemary in bowl. Place chicken in large roasting pan. Brush with half of mustard mixture. Roast until thermometer inserted into thickest part of thigh registers 170°F, about 1 hour 45 minutes. Meanwhile, brush large baking sheet with oil. Reserve 1 tablespoon mustard mixture for sauce. Toss onions, turnips, and carrots with remaining mustard mixture in bowl. Spread out on baking sheet. Roast until tender and beginning to brown, stirring twice, about 1 hour. Transfer chicken to platter. Spoon off fat from juices in pan. Place pan atop 2 burners. Whisk in broth and reserved mustard mixture. Boil until reduced to 1 1/4 cups, about 5 minutes. Season with salt and pepper. 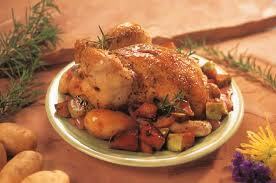 Place chicken on platter; surround with vegetables. Serve with sauce.Enjoy the convection oven recipe !